Hi, yes if you follow the steps described in Section 5 of the S-1 Radiometric Calibration document, https://sentinel.esa.int/documents/247904/685163/S1-Radiometric-Calibration-V1.0.pdf, then your point targets could be used to match the LUT’s values. However, I suggest you use a different approach - calculate the measured radar cross-section of your point targets (I assume these corner reflectors) and compare with the theoretical radar cross-section of your CRs. Ideally the differences should be small. The TOPSAR-Merge module enables you to do that. The images just need to be first debursted (TOPSAR-Deburst). Hi, I have obtained one of your image - from 06/03/2018 - and located your corner reflector. It is at pixel coordinates 10177, 12657 in sub-swath IW2. 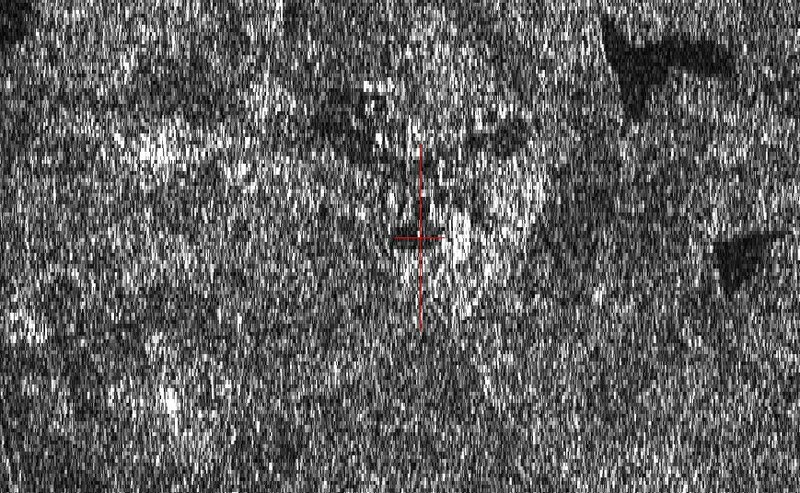 The cross in the image below shows the predicted position using a terrain height of 660 m. The CR will be at a similar position for your other images. Hi, could you please expand on which angle you are wanting to calculate and why. For example, is it the incident angle at your location from the product annotation. Many thanks. 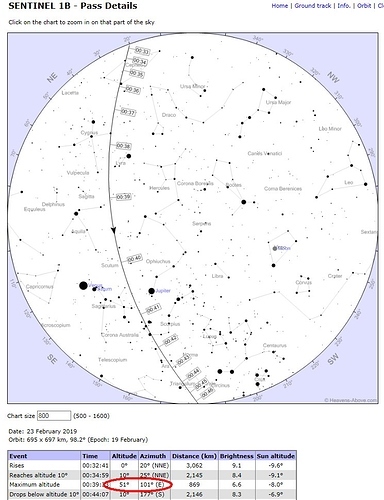 Hi, I suggest you use the Heavens-Above (HA) web site (https://www.heavens-above.com/) to find the altitude (=elevation) and azimuth for the pass you are interested in. To use HA you will need (I) to set your location (e.g. Devarakaggalahalli) and time e.g. GMT+0hrs, (ii) select a satellite, e.g. S1-A from the ‘Satellite Database’ link down the left hand side of the HA home page. 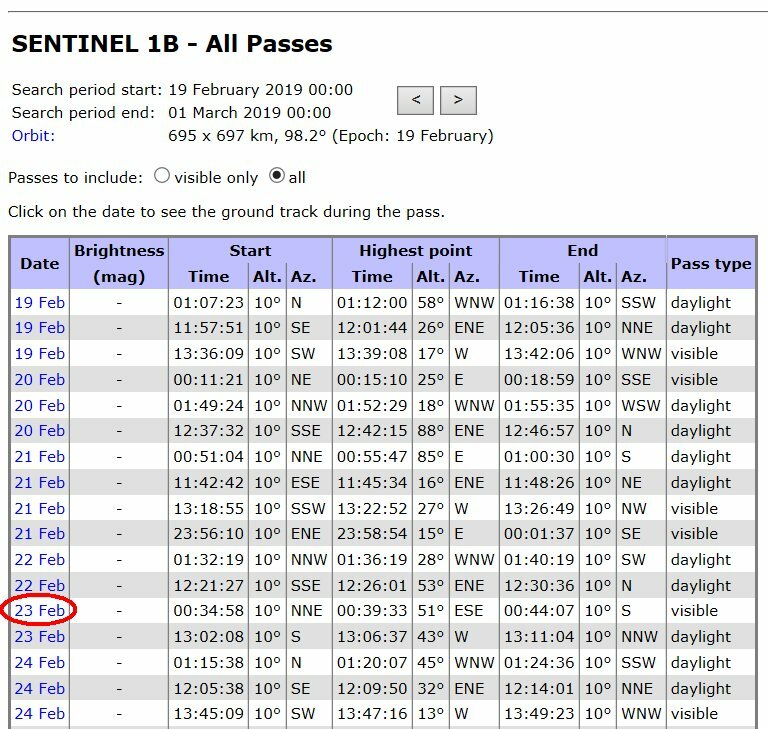 Once you have found Sentinel1-A, select ‘All Passes’ to give a list of when S1-A will be above the horizon from your location. If you click on the date for each pass, you will get more information, including at the bottom, the altitude and azimuth at Maximum Altitude. For example, there will be an IW acquisition over Devarakaggalahalli with S1-B on 23rd February 2019 between 00:35 and 00:40 UT (see planning at https://sentinel.esa.int/web/sentinel/missions/sentinel-1/observation-scenario/acquisition-segments). 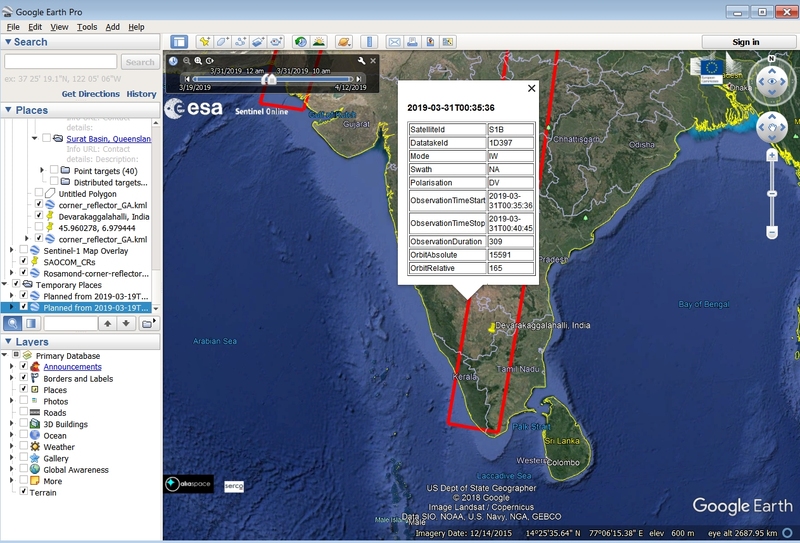 As shown in the screenshots below, S1-B will be at an altitude/elevation of 51 deg and azimuth 101 deg at 00:39 UT. Hi, for your second query, I suggest you look at the planning for S1-A and S1-B available via https://sentinel.esa.int/web/sentinel/missions/sentinel-1/observation-scenario/acquisition-segments. You will need to download the latest kml files and use with Google Earth - as the screenshot below shows, the next acquisition over your site is on 31st March.